RE/MAX of Bartlesville Realtors are all full time--no part-timers here. Presently 12 associates are ready to serve you with all of your real estate needs. 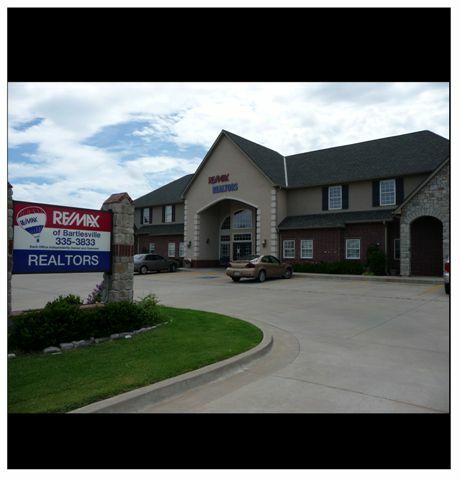 RE/MAX of Bartlesville was started in 1991. We have the experience in this home market that will give you an edge, whether you are buying or selling. Our Realtors have the most advanced equipment and training available in the Midwest including their own secure satellite system that beams in over 100 hours of training each month. RE/MAX of Bartlesville Realtors are members of the Greater Tulsa Association of Realtors, the National Association of Realtors, the Employee Relocation Council/Oklahoma Association (ERC), and the Children's Miracle Network. RE/MAX of Bartlesville Realtors continue to be #1 in units sold per Realtor, the most efficient Realtors in the Bartlesville area of the top five companies. RE/MAX of Bartlesville Realtors give you the advantage of working with a small...individualized...caring office yet they have the logistical and technological support of the nation's #1 real estate organization. We call it "High Tech, High Touch - Home Team"
That's what RE/MAX Real Estate Professionals are all about. Across North America, RE/MAX associates average 10 years of experience. Twice the industry average! That experience means RE/MAX Associates are better qualified to set the right prices for the homes they list, better equipped to market those homes, and more likely to find a buyer in a shorter period of time. As a result, the average RE/MAX Associate in the U.S. out-produces competing realtors by a 3-to-1 margin. Call it the margin of success. There's no substitute for experience. And in real estate, there's no substitute for a RE/MAX Top Producer! RE/MAX Sales Associates are personally vested in the homes they list. Unlike realtors of most other companies, RE/MAX Associates are free to spend as much as they need to promote a particular property. RE/MAX Top Producers know the value of smart marketing. This year, RE/MAX Associates are expected to spend over $130 million in personal and group advertising. When a RE/MAX Associate lists a home, he or she makes a personal financial investment. If the home doesn't sell, the realtor can actually lose money. No wonder RE/MAX Associates are so determined to find the right buyers willing to pay the right price. RE/MAX is one of the fastest growing real estate organizations in the world. With independently owned and operated offices throughout North America, the RE/MAX system stretches from Newfoundland to Hawaii, the Dominican Republic to Alaska. The tremendous growth of RE/MAX means added service to clients and customers everywhere. Throughout the RE/MAX Referral System--the most effective service of its kind--RE/MAX Associates are able to help real estate customers who are moving to a new area find the right home before they relocate. At the same time, the RE/MAX Referral System provides a new source of home buyers for listing clients. People like you, who expect the maximum in service from RE/MAX. RE/MAX is the No. 1 real estate organization in terms of professionalism, education, production of associates (out sells the average NAR associate 3 to 1), and in years of experience per associate in North America. RE/MAX is the No. 1 company in terms of sales in the United States, Canada, North America, and now the entire World. RE/MAX has offices in the United States, Canada, Mexico, the Caribbean, South Africa, Europe, and Asia. Over 4,400 offices are now open with over 84,000 realtors in 44 countries. RE/MAX has hte highest percentage of CRS, ABR, and CRP designated Realtors in the United States.